See the best photos from today. 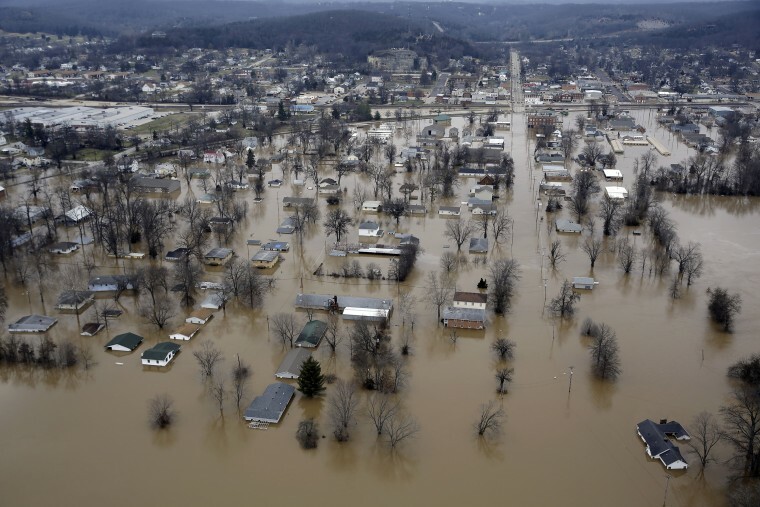 Floodwater surrounds homes and businesses in Pacific, Mo. on Dec. 30, 2015. A rare winter flood threatened nearly two dozen federal levees in Missouri and Illinois on Wednesday as rivers rose, prompting evacuations in several places. 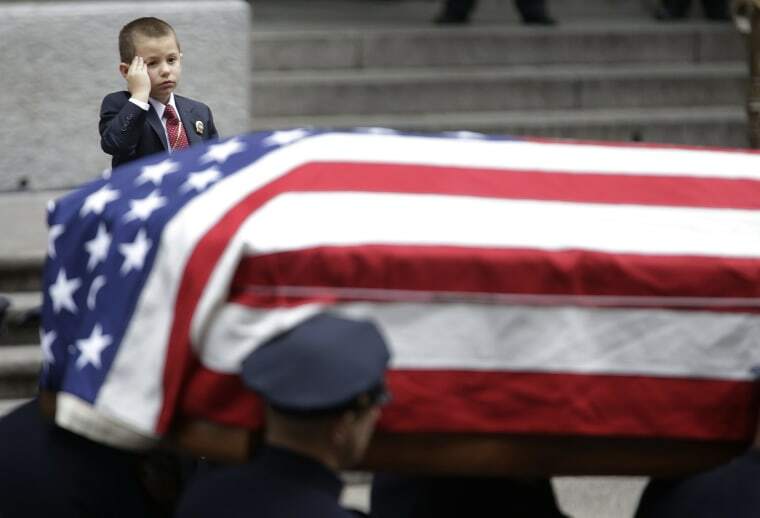 Ryan Lemm, 4, son of Joseph Lemm, salutes as his father's casket is carried out of St. Patrick's Cathedral in New York, on Wednesday. Lemm, who was a technical sergeant in the Air Guard's 105th Base Security Squadron and a 15-year veteran of the New York Police Department, was killed when his patrol was attacked by a suicide bomber outside Bagram Air Base in Afghanistan. 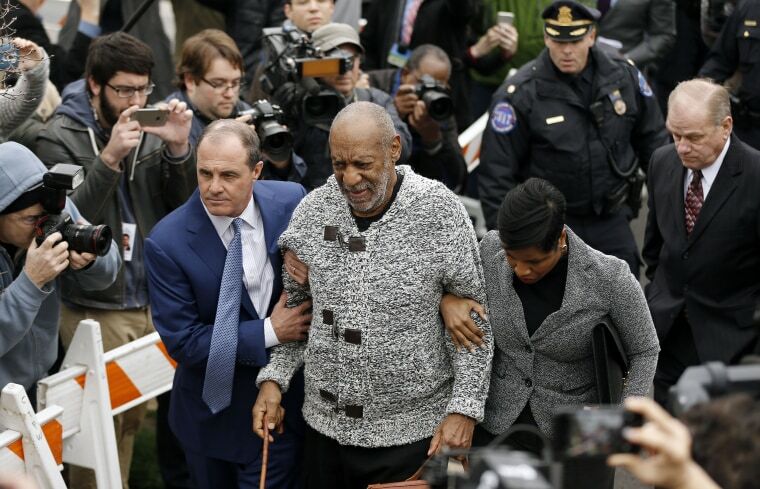 Bill Cosby arrives at court to face a felony charge of aggravated indecent assault in Elkins Park, Pa. Cosby was charged Wednesday with drugging and sexually assaulting a woman at his home 12 years ago. 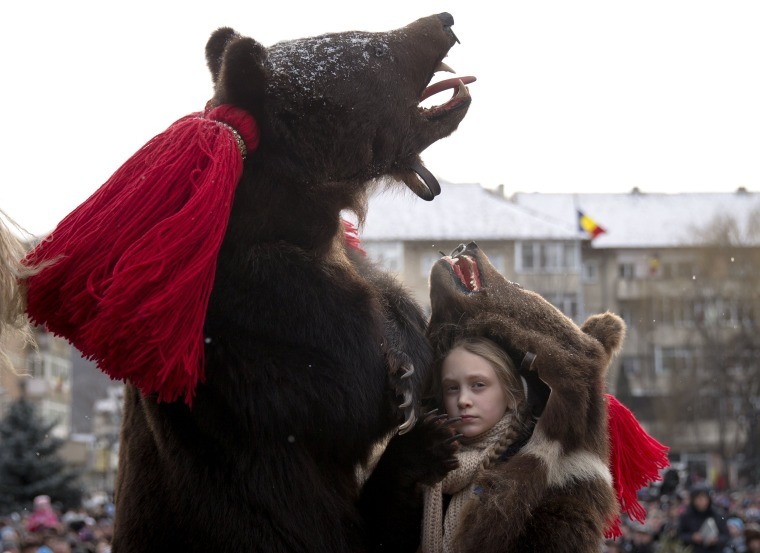 People wearing bear furs perform during a festival of New Year ritual dances attended by hundreds in Comanesti, northern Romania, on Wednesday. In pre-Christian rural traditions, dancers wearing colored costumes or animal furs, toured from house to house in villages singing and dancing to ward off evil, in the present the tradition has moved to Romania's cities too, where dancers travel to perform the ritual for money. 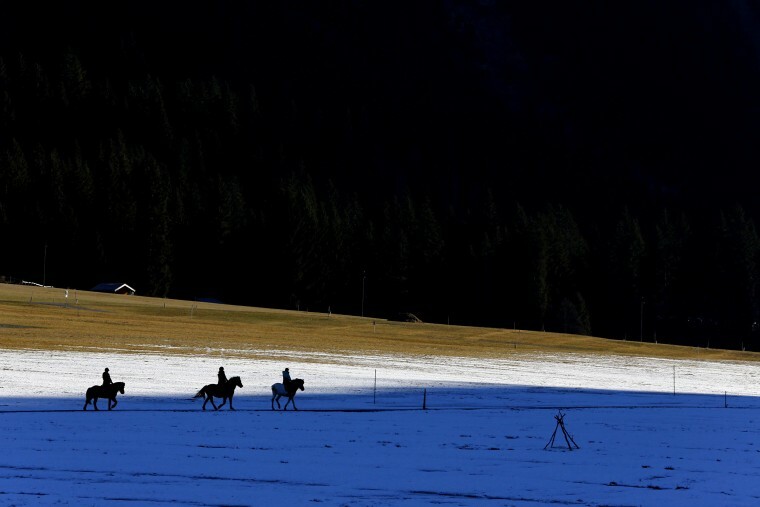 People on horses make their way over snow covered meadows near Haller, Austria, on Wednesday. 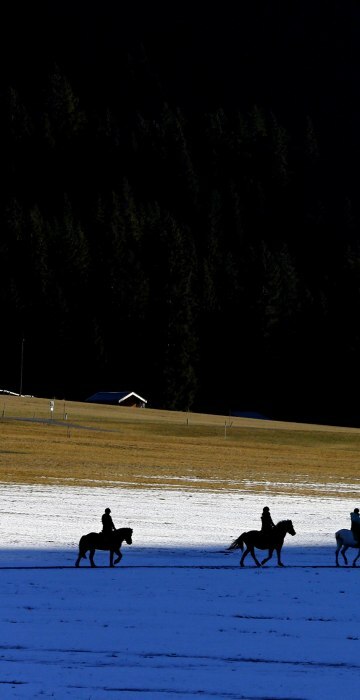 The weather forecast predicts cold weather with rain for the upcoming days. 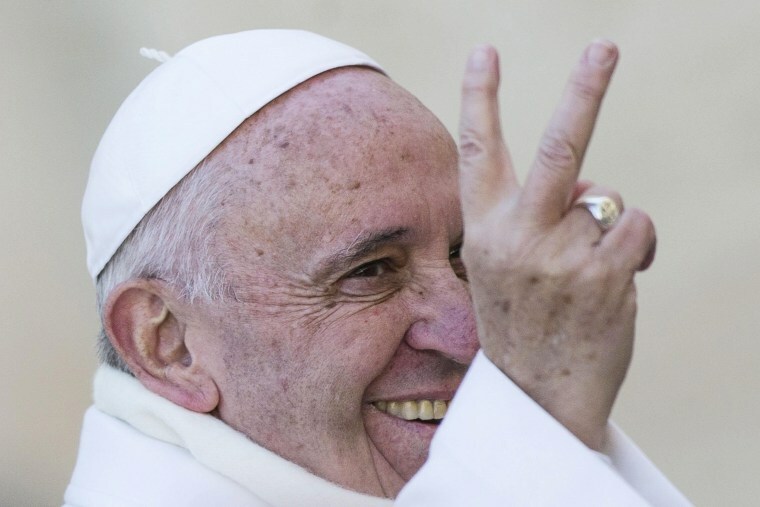 Pope Francis gestures to pilgrims and tourists with two days left until the new year, during the weekly general audience in St Peter Square in Vatican City, on Wednesday. 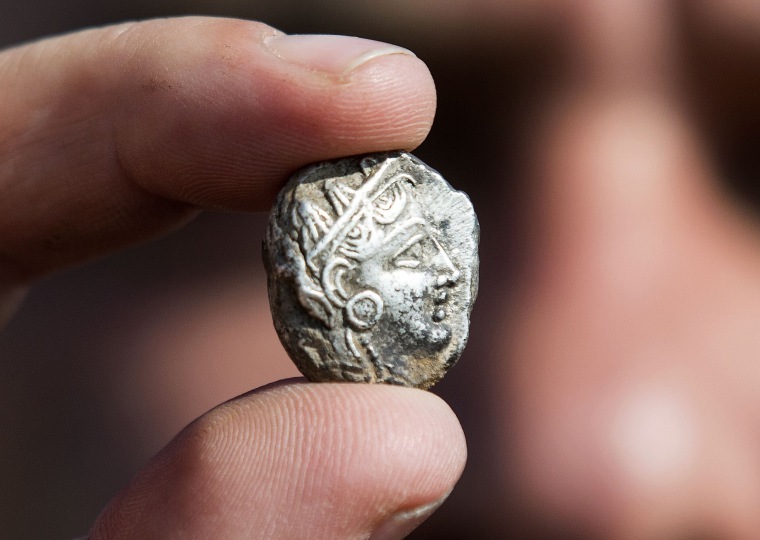 A coin with the effigy of Athena dating to the fourth century BC was found in a Byzantine period farmstead during an archaeological excavation conducted by the Israel Antiquities Authority at the construction site in Rosh Haayin, Israel on Wednesday. 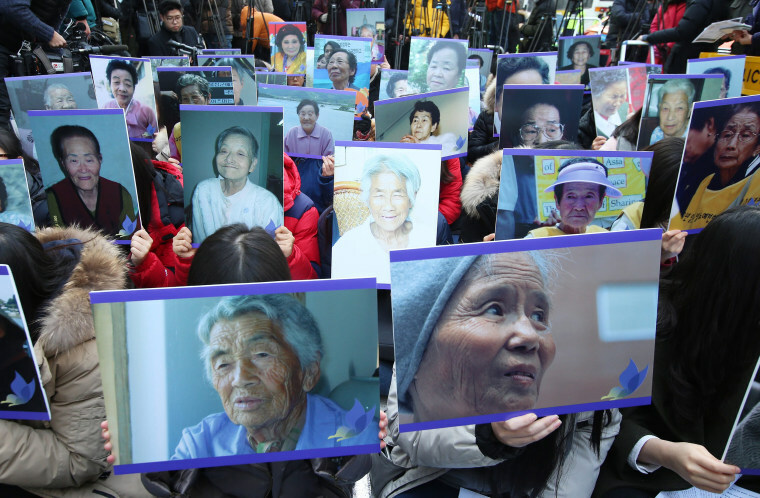 South Korean supporters hold up pictures of deceased former comfort women during a rally against the Japanese government, near the Japanese Embassy in Seoul, South Korea, on Wednesday. Japan and South Korea announced an agreement Wednesday on the Japanese army's past use of sexual slavery, an issue that has poisoned relations between the Asian neighbors for decades. Japan wants a statue to be removed as part of the agreement. A woman waits to cast her vote at a polling station on Wednesday as people go to the polls to take part in the country's presidential and legislative elections in the Muslim district (R)PK 5 of Bangui. 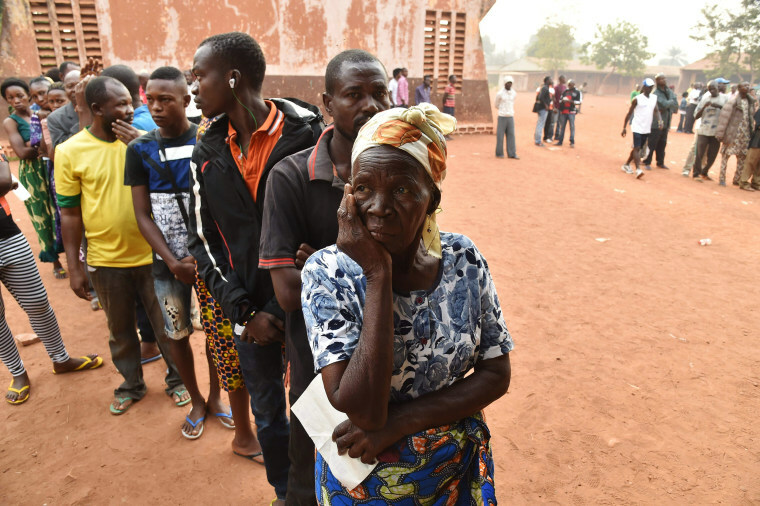 The first round of presidential and legislative polls kicked off in the conflict-torn Central African Republic, with 30 candidates running for president and 1,800 vying for a seat in the National Assembly. The long-delayed elections that are key to ending years of brutal sectarian unrest were postponed on December 25 for three days until December 30. 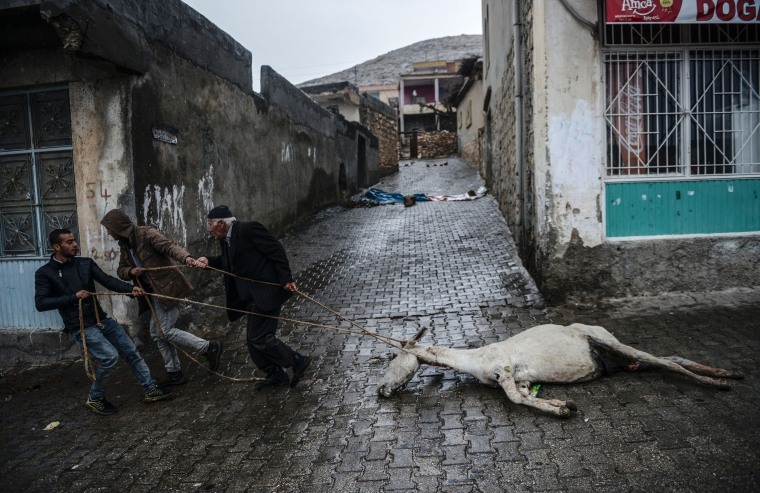 Men drag a dead donkey along a street after it was removed from the grounds of a home in Dargecit, after a curfew imposed by the Turkish government was lifted on Wednesday, in Mardin province. Tensions are running high throughout Turkey's restive southeast as security forces impose curfews in several towns in a bid to root out Kurdistan Workers' Party (PKK) rebels from urban centres. It is unknown how the donkey died.